Last fall, Limestone Branch Distillery’s visitor experience got even better with some major enhancements! When guests visit, they can now follow a visual timeline of the history behind the brands and the families. The new timeline takes visitors through the beginning of the Yellowstone® brand in 1872, through Prohibition and into its heyday as the bestselling bourbon in Kentucky in the 1960s, all the way until present time. Throughout the timeline, historic artifacts visually punctuate the timeline at the appropriate times, including a beautiful hand-painted Yellowstone bottle from the late 1800s, a “medicinal use only” bottle from the Prohibition days and some vintage advertising from the 1960s. All in all, more than 200 artifacts are part of the tour. In addition, a family tree has been added to help explain the ancestry of the Beam and Dant families. Having distillers on both sides of the family tree, the art explains how the families intertwine through the early history of distilling. “The family tree begins with Jacob Beam, who began distilling in 1795 and J.W. Dant, a pioneer distiller who began his career in 1836 using a hollowed out log as his still,” says Steve. With more than 18,000 visitors in 2018, Limestone Branch is ready to welcome thousands more this year. And no visit would be complete without spending some time with the distillery pups, Char and Bosley, who are happy to welcome visitors! 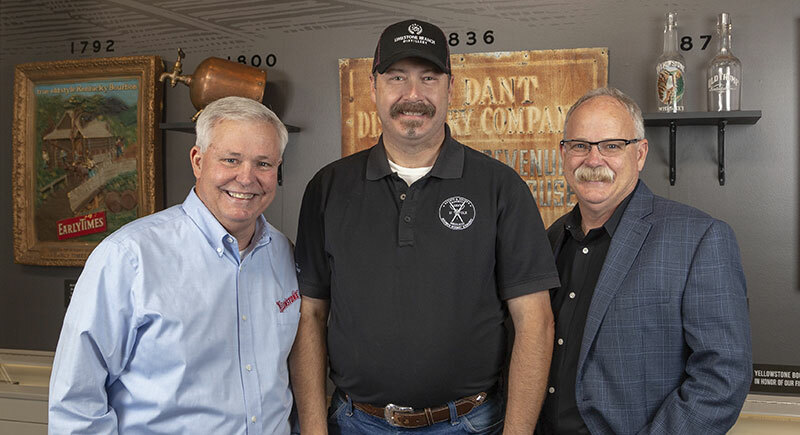 To round out the visitor experience, a short video of Steve Beam, seventh-generation distiller, and his brother Paul explaining the origin and mission of the distillery was added for a personal touch. And, of course, the highlight of the tour continues to be the tasting room, where they can taste some of the finest bourbon on the Kentucky Craft Bourbon Trail.